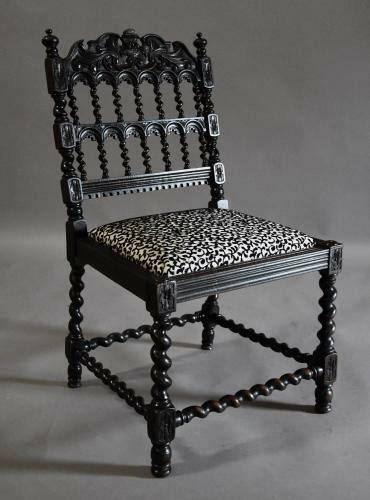 This chair consists of a carved top rail with scrolling foliate designs leading down to two rows of carved arcaded design with seven barley twist turned supports with carved and moulded rail below. The drop in seat has been upholstered in a fabric to compliment the chair but this can easily be changed once purchased, the front, side and back rails being of moulded design with carved flower decoration to the outer edges of the front rail. The chair is supported by four barley twist turned legs, all joined with turned barley twist stretchers terminating on turned feet.